Rarely can the power and majesty of tigers and elephants have had such an impact as when Mike Birkhead played the footage he had compiled for his talk on November 23rd - spellbinding photography had captured these creatures at close-quarters and the haunting images, combined with their roaring and trumping, made for an extraordinary experience. 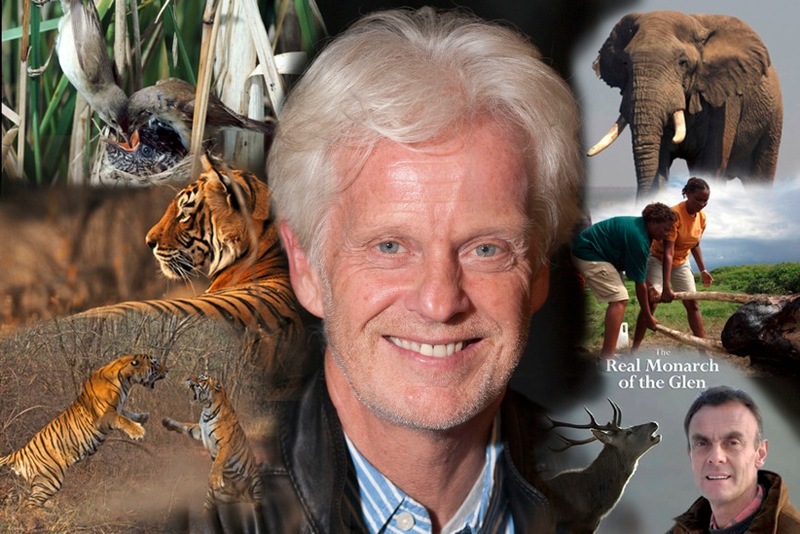 Mike is one of the world's leading wildlife film-makers and the compilation had been specially edited for his appearance in Wootton, offering a remarkable insight into the logistics and techniques involved in filming such magnificent creatures. Mike has made many films about tigers, including one on Machli, the world's most famous tiger, which he and his team have followed for the past 14 years and she is now coming to the end of her life. Another film, shown on the BBC in July, features a billionaire who is spearheading a controversial project on the island of Sumatra, in Indonesia, to reintroduce man-eating tigers as the most effective way of saving the species. The film focused on the reaction to the exercise of Alan Rabinowitz, an American zoologist known as the "Indiana Jones of wildlife protection", who flew to Sumatra to assess the project - at first, he was sceptical but eventually found many positive elements after it appeared the released tigers were staying clear of humans. 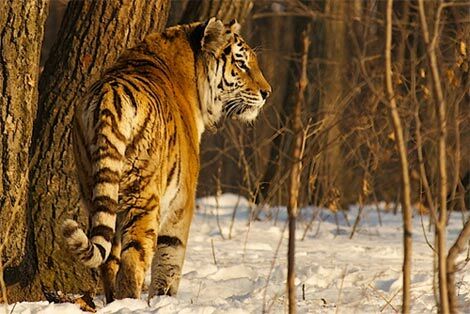 But in the world of wildlife film-making, Mike's greatest admiration is for the Korean Sooyong Park, who has spent 17 years filming Siberian tigers and often waited three months for a single shot. However, on one occasion, after months of nothing appearing, a group of Siberian tigers, each weighing 550lbs, stood on top of his hide, causing it to collapse. But in a very moving sequence, Sooyang recalled the visit of a friend after many days of solitude and that when he left - leaving him to face the prospect of more time alone - he realised that humans are not meant to be solitary. Another highly affecting film featured a remarkable female elephant, called Echo, which Mike followed for many years - but not as long as Cynthia Moss, a scientist who had known her for 40 years, and a researcher called Kaitito. Mike was setting out for a holiday in Suffolk when word reached him that Echo was dying at the age of 65, but he managed to get a cameraman to film her dignified last hours - described on film so movingly by a very tearful Kaitito. Mike pointed out that elephants have remarkable memories and recalled one in particular which, in a line of the animals, would always recognise a particular cameraman and lift up his equipment with its tusks. In his films, Mike is keen to have a human element and this was highlighted in the story of Paul Lister, son of the millionaire founder of MFI, who erected a 35-mile long electric fence in the Highlands of Scotland as part of a plan to introduce wolves, bears and lynx to the region. In the end, only a couple of moose were brought in, but it was a highly ambitious dream - as was Paul's venture opening a village shop in the area, which Mike also filmed, including some comedic elements (sadly, the shop has now closed). Another sequence in his talk featured Mike's work with cuckoos, which proved one of the hardest to film. Of course, the cuckoo is one of the most familiar sounds of spring but it is also known as a "brood-parasite", in which the female lays its eggs very quickly in another bird's nest. The cuckoo chick hatches earlier than the host's and evicts its eggs through instinctive behaviour - and the host bird continues to feed it, even though it is much bigger. Many years ago, some footage of a cuckoo behaviour had been shot by Edgar Chance but replicating it proved hard until a local Oxfordshire expert, Mike Bayliss, suggested the perfect time and place to capture this amazing behaviour. Mike told us that his favourite place on Earth is Namibia, where he has filmed the large range of wildlife, including elephants, which manage to survive in the harshest of desert conditions. Giving an insight into the arduous nature of filming such creatures, he recounted the time a six-ton bull elephant walked through their camp in the dead of night, thinking death from crushing was a possibility. In the end, the elephant shoved its trunk into a bag in the filming-truck in a search for food and then ambled on its way. To a question from one young member of the audience about his favourite animal, Mike pondered for a while and then replied that it was probably the tiger, with its amazing eyes, colouring and majestic behaviour. "The sensational footage of wildlife that Mike had complied, featuring snarling tigers and regal elephants, was truly awesome - and the sound system did justice to the magnificent film, providing a real cinematic experience. Not only is Mike one of the world's best film-makers, he recounted his experiences and triumphs with a consummate modesty and humour - an absolutely brilliant evening - Joe Riley, Oxford.